Among the many pleasures Jacksonville, Ponte Vedra, and St.Augustine have to offer residents and visitors, there exists the opportunity to indulge in culinary expertise in the comfort of your own home. 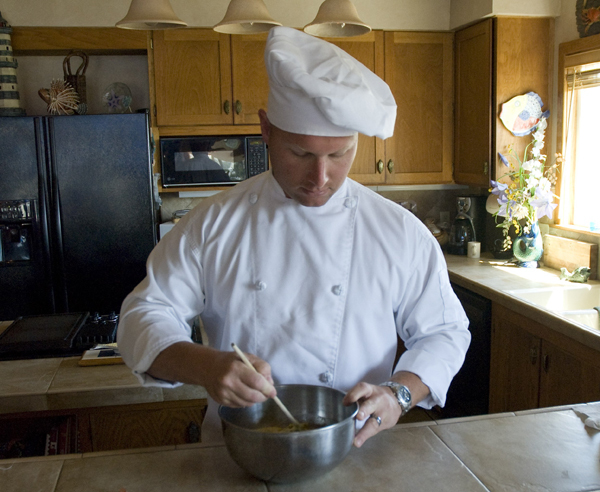 Personal Chef Sean Callahan has been serving up culinary excellence for over fifteen years now. After a beginning in Italian cuisine in 1992, working up to point cook and then obtaining a culinary degree in 1998, Chef Sean honed his skills working in restaurants in Ft.Lauderdale and Palm Beach before moving to Jacksonville and creating FITT for Life, a fitness and culinary fusion. There is no need to go out in the cold or wait in line somewhere to experience a great dining experience. Let your very own Personal Chef serve you dinner in the comfort of your own home or vacation rental. About Chef Sean: he is a licensed and insured personal chef with professional culinary training and certification. While specializing in cooking for small parties of 25 or less, Sean has also been hired on as a corporate personal chef by Alegro Funding Corporation. Clients can choose to add additional courses, appetizers, tapas or simply have the main entree or the main entree with salad. All meals are prepared from scratch using the freshest ingredients available. Number of meals per week? Date and time of service? Buffet style, or a sit-down, plated dinner? Formal, casual, or somewhere in between? Personal preferences for ingredients, dishes, style of cuisine, menu ideas, etc. These and many other options are available to you. We encourage you to contact FITT for Life at 860-0153 to check availability and schedule a Personal Chef for your next event or evening at home.